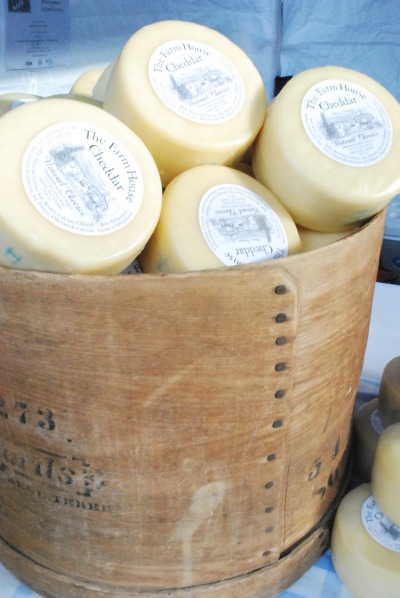 Homesteader’s Emporium is once again offering a 5 hour hands-on cheese making workshop with Debra Amrein-Boyes of The Farm House Natural Cheeses! The workshop is coming up fast on Saturday, October 26th 2013, so get your tickets asap! If you’ve done a workshop at Homesteader’s storefront, you’ll know it’s not up to the task of a hands-on kitchen experience, so this course will be held off-site at Skwachàys Lodge 29 W Pender Street, which has a wonderful commercial kitchen and communal table perfect for this type of cooking workshop. This is a rare opportunity to do a workshop with a professional local cheese maker and it’s only the second time she’s come into Vancouver to teach one, both time being thanks to Rick Havlak of Homesteader’s Emporium. Instructor Debra Amrein-Boyes is the head cheese maker at The Farm House Natural Cheeses in Agassiz, BC and is one of only twelve persons in western Canada and US who has been inducted into the prestigious French Cheese Guild, the “Guilde des Fromagers Confrerie de Saint-Uguzon”, which recognizes those who protect and continue the tradition of cheesemaking around the world. Her book, “200 Easy Homemade Cheeses recipes-From Cheddar and Brie to Butter and Yogurt”, was nominated in 2009 for a World Gourmand Cookbook Award. Location: To provide a hands-on kitchen experience, this course will be held off-site at Skwachàys Lodge 29 W Pender Street, Vancouver BC. If you miss out, don’t despair, Rick Havlak of Homesteader’s Emporium will be demonstrating cheese-making on November 2nd 11am-12:30pm. It’s an open house, so you can drop -in at any time, but if you want to guarantee a spot register in advance. $5 suggested donation.